Let the kids sleep good too! Respira waterproof and hyper-breathable fitted sheet and mattress protector made from 100% organic cotton fabric. The Velfont Respira Waterproof and Hyper-breathable Fitted Sheet and Mattres Protector is made from extra soft 100% organic combed cotton fabric which is extremely pleasant to touch. Memory foam cot pillow with anti-dustmite cotton fabric. This pillow is ideal for people with babies who are allergic to dustmites or who want to ensure their baby enjoys an ergonomic and healthy sleep, with greater breathability and comfort. Its 100% cotton outer fabric incorporates the Acarsan® anti-allergenic. Duvet with fiber filling, coloured microfiber fabric and super-soft touch. Nordicolor Duvet is made from microfiber fabric that combines a coloured side with an embossed silky soft white side. 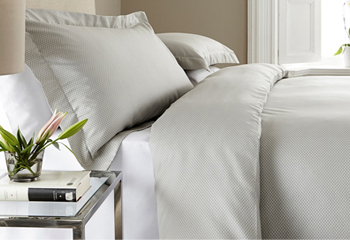 The filling of the duvet is top quality Neotherm® hollow conjugated siliconized fiber, which ensures the perfect combination of thermal capacity and comfort.